Why wait for E3 to announce your biggest game of next year, right? First, Sony goes and reveals Killzone 3, and now Nintendo has revealed North American release plans for Pokémon Black and White for DS. The next generation of Pokémon will be released in spring 2011. There are few known details about this new Pokémon game, other than the existence of a new city environment, the designs for the new starter Pokémon, and the fact that the Black and White versions are supposed to represent a "rebirth" for the franchise. 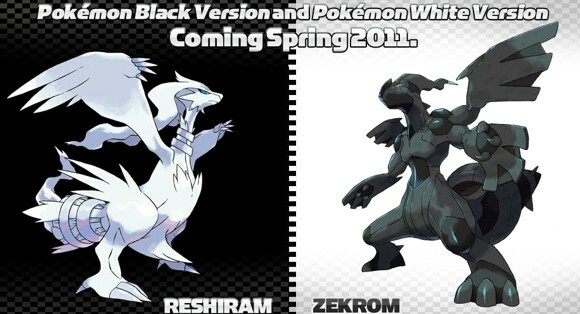 Today, along with the North American release window announcement, Nintendo revealed that the box art for Pokémon Black will feature the legendary Pokémon Reshiram and White will feature Zekrom; as seen above (via Pokemon.com). So, you can start planning your purchase based on your preference between two freaky winged things. Black just looks like it'll OWN YOU!!!!!! Because the male mc ain't good enough. Black looks like it will PWN you but I might try White. both of the pokemon look like shet, if i get this it will be solely for the battle animations.